Everyone is aware of Flipkart"s The Big Billion Day Scam where they claims to give 30-90 % discounts on products . But you all knows the reality what they have done in the name of discount . So, whenever you decide to buy online , its better to compare the prices in other sites and see the differences. I have personally experienced an incident and this blown away my mind. 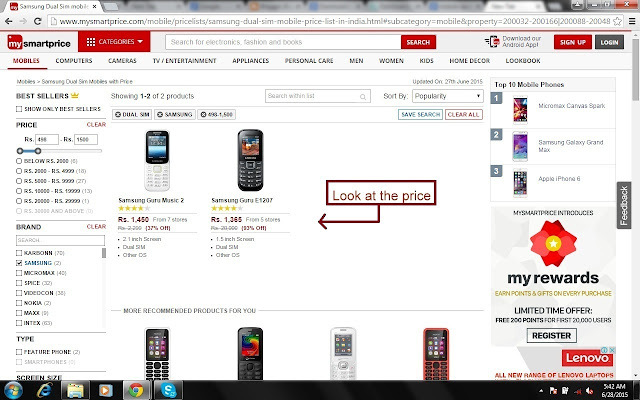 I was looking at the mobile phones on the famous site My Smart Price ( One of the most trusted sites I believed ) . I use to visit the site regularly to buy products and gather information about latest mobiles . Mobile Price of Samsung Mobile with 93 % Discount ? I was astonished to see the discount of 93% on one of the mobile . Yes, you are right, they are giving whopping discount of 93% on mobile phones . Isn't it cool . I mean Who'd not like to buy a mobile at this discount rate ? No more suspense, the mobile is Samsung Guru E1207 whose actual price is Rs.20,000 (according to the site) and site is selling at Rs.1367 with the said discount . I went crazy after watching this. First , Look at the screenshot . Now, tell me Is this mobile worth Rs.20,000 ? Can you compare it with Samsung Galaxy Series, Sony Xperia Series, Micromax Cavas , and other Smartphones . I decided to look further on mobiles and found there are only two mobiles between price Rs. 498 and 1500 . I have no problem with the first one which is Samsung Guru Music 2 because its price looks worth. But the second one is off the track . I mean its screen is just 1.5 inch and not even an android phone . Are you kidding me ? I bet you are not . I would like to say to My Smart Price " This time Not So Smart Price !"